This creep machine, called Alter, runs entirely off a neural network. That means all its incoherent and erratic movements are 100 percent free of any human control. It’s basically alive. Although Alter looks like it’s dressed up in some kind of Ex Machina cosplay, it’s underneath where all the interesting stuff is happening. Alter has 42 pneumatic actuators and a “central pattern generator,” according to Engadget’s Mat Smith. The CPG essential creates the robotic equivalent of neurons, so the robot can move. The robot doesn’t resemble or sound anything like a human (yet). Alter’s erratic movements are based on sensors that can detect noise, temperature, humidity, and proximity. These sensors act as simple stand-ins for our own senses. Also, its strange vocalizations are actually sine waves depicting the movement of the robot’s fingers, according to Engadget. 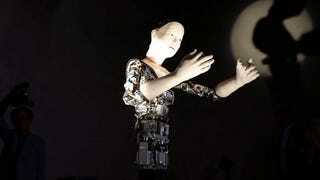 Alter was created by two robotics laboratories in Tokyo and Osaka and is currently on display at Tokyo’s National Museum of Emerging Science and Innovation. The exhibition will end later this week, so the robot isn’t long for public life, but it’s still posing for the paparazzi anyways.